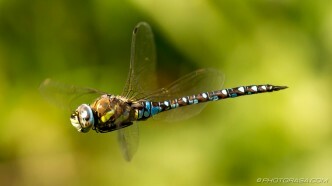 Photos and Picture galleries of dragonflies. 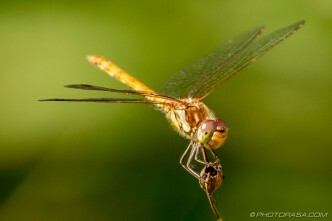 They are large predatory insects of the order Odonata Anisoptera, having large eyes, a long slender body, and two pairs of transparent veined, iridescent wings, which they hold outstretched, perpendicular to the body, when at rest. This distinguishes them from the similar damselfly which holds its wings parallel to the body at rest. The dragonfly is a striking insect – it is large, often brightly coloured, is able to hover effortlessly in flight and can appear quite intimidating. It is, however, harmless to humans. 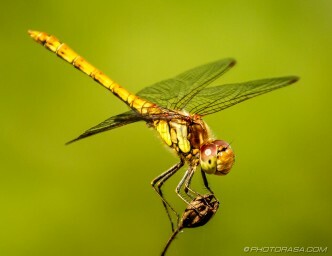 The dragonfly has many regional nicknames including the darner, darning needle, devil’s darning needle, mosquito fly, mosquito hawk, skeeter hawk, snake feeder, snake doctor, needle and spindle. It has aquatic larvae that can take up to 5 years to develop into adults. Female Common Darter clinging to a dead flower and looking up.